The first few days and year of your truck driving career will seem like some of the most challenging times of your career. You're starting a new job, and beginning to become part of a completely different lifestyle than what you're used to. A lot of times new truck drivers don't really know what to expect in their first few days and year of trucking with PAM Transport. This can add to the list of challenges you take on when you decide to become a truck driver. Below, we've outlined what opportunities are available in your first year with PAM, and what you should expect in your first day and year on the road to try and help make the transition into trucking as easy as possible. Knowing what to expect will have you that much better prepared to be successful. If you haven't already, apply now to join the PAM Transport team and be on your way to starting a great new career in the transportation industry! Oftentimes veteran truckers describe their first year on the road as the most challenging of their careers. A new truck driver has to learn the ways of the road while managing adjusting to a lifestyle away from a home. In your first year on the road with PAM, you'll start out driving with a teammate. You'll be able to run more miles, and thus make more money together. Taking advantage of the opportunities listed above will maximize your earning potential as well. Don't believe us? What if we told you that these are coming from someone who's been there before? In fact, Trucker Wayne has been blogging with us to help new drivers get adjusted to life on the road. We encourage you take a minute to read his full article on the 6 Truths About Your First Year Trucking here, or check out the rest of our blog for more great tips and resources to help you get through your first year. In your first year on the job, there are a lot of adjustments to make both personally and professionally. You need to be able to be flexible with your schedule while making sure you stay on time on your routes. Understanding that things can change on the fly with your schedule between your recruiter and fleet manager is crucial. They'll do their best to respect you and make sure you get the routes you need as long as you show them the respect they deserve too. You can read all about building the relationship between you, your dispatcher, and your fleet manager here. Whne you start driving with PAM Transport, you'll be an OTR driver, meaning you'll be on the road away from home for 2-3 weeks at a time. You could be sent anywhere in the country to make deliveries, meaning you have to think about and be prepared for the climates you'll drive through. Make sure to be prepared for cold weather, which can hit you at any moment. This article gives you some great tips for being properly prepared for the winter driving months. Getting through your first year in trucking is a challenge, but the rewards make it worth it. You'll learn quickly on the road how to get the hang of things, and life will slow down and get easier. Once the job itself slows down a little bit, you'll be able to really take in and enjoy the advantages of truck driving. 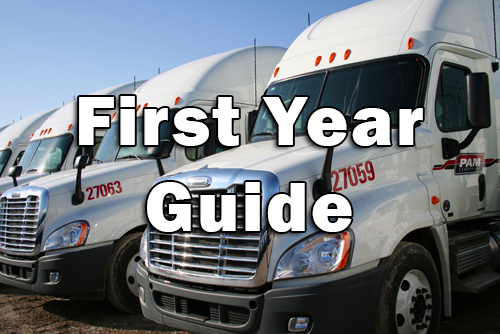 We hope this Guide to Your Trucking Firsts will help you make the transition to your new career as smooth as possible. There's a world of opportunities when you make the decision to become a truck driver. 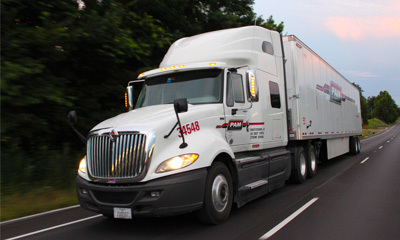 Make the right move, and apply with Driver Solutions today to get the training you need. On top of that, we'll have a job waiting for you upon successful completion of training!